Researchers in Egypt discovered a 1,700-year-old school with its walls covered in Greek texts referring to a passage about drugs from The Odyssey. The school is located in the ancient town of Trimithis, now called Amhelda, in Egypt's western desert. 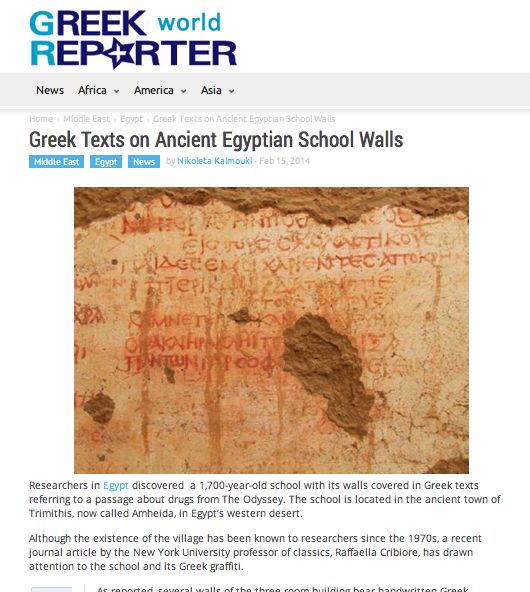 . . . . a recent journal article by the New York University professor of classics, Raffaella Cribiore, has drawn attention to the school and its Greek graffiti. As reported, several walls of the three room building bear handwritten Greek inscriptions . . . .